Ready to start making your own tiki drinks? Someone who has gone to a tiki bar or two and wants to learn more about making drinks at home? Someone who has dabbled in home bartending and wants to explore tiki territory? Someone who has started to stock a home tiki bar but is struggling with the process? Someone who wants to learn how to serve up some fruity tropical cocktails when friends come over? If you answered "yes!" to any of the questions above, just know that we've been there, too. That's why we came up with an ebook for beginners. 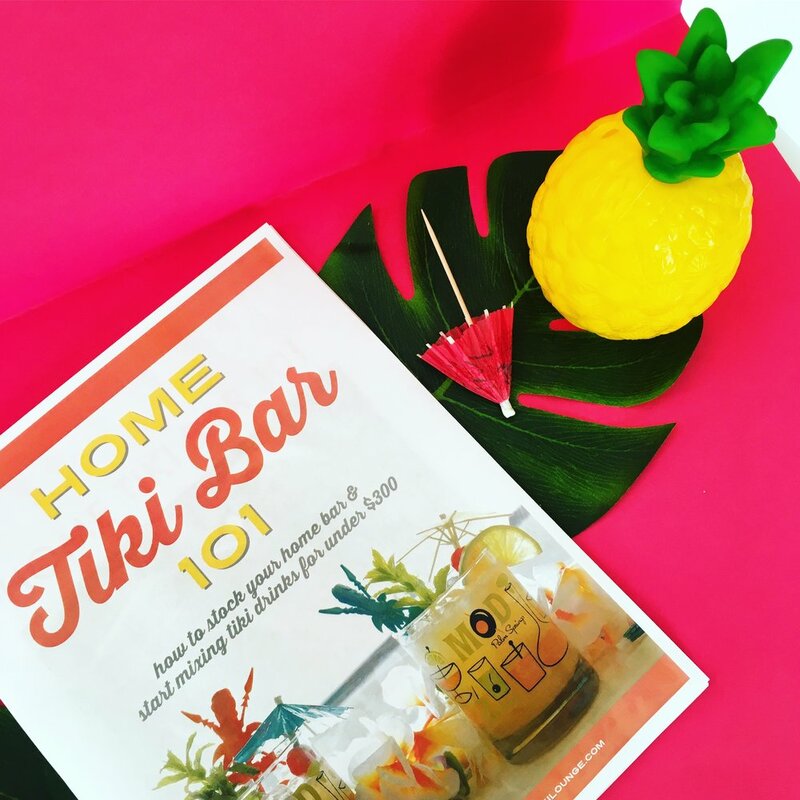 Home Tiki Bar 101 offers the guidance we wish we had when we were stocking our home tiki bar (completely from scratch) & learning to mix tropical drinks. Get the ebook for just $7! 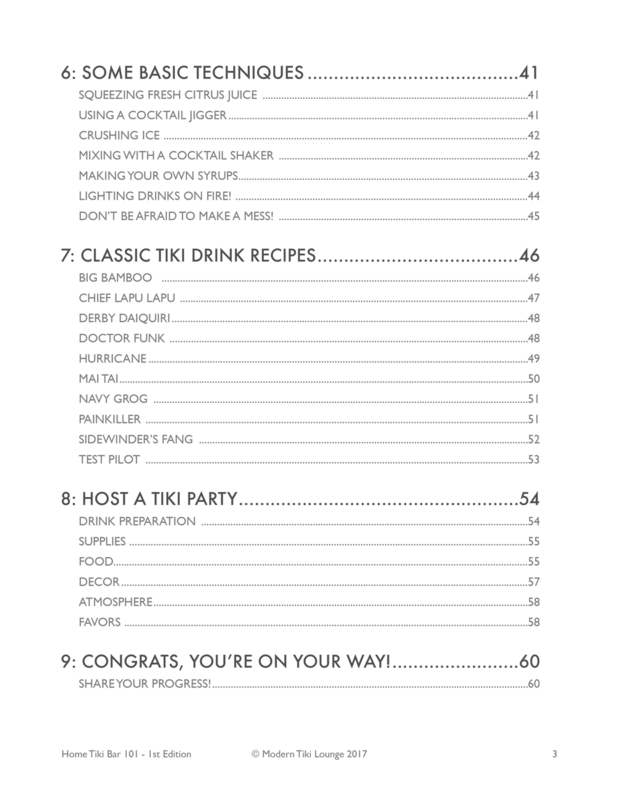 This guide is perfect for anyone who is from the absolute beginner all the way up to someone who has been dabbling in making their own tiki drinks at home but hasn't mastered them yet. This ebook is NOT for experienced home mixologists or for anyone who already has an established tiki bar stocked at home. This ebook is also not for anyone looking to build a physical tiki bar (we wish we could help you, but we can't...although we might be able to help with the design). Lastly, Home Tiki Bar 101 is not for anyone looking to start a professional tiki bar. We've never delved into that territory and you'll need a lot more advice than what we're covering in this guide. Do I need to have anything before I get started? Nope! We'll give you lists of all of the tools & ingredients you'll need at home to get started. How much will it cost me to start from scratch? For the shopping lists we're providing, if you have absolutely no tools in your kitchen, those will cost you about $100. If you have no drink ingredients at all, those will cost just a little over $200 total. While this might seem like a large up-front investment, these supplies are necessary to get started and will last you for quite a while. 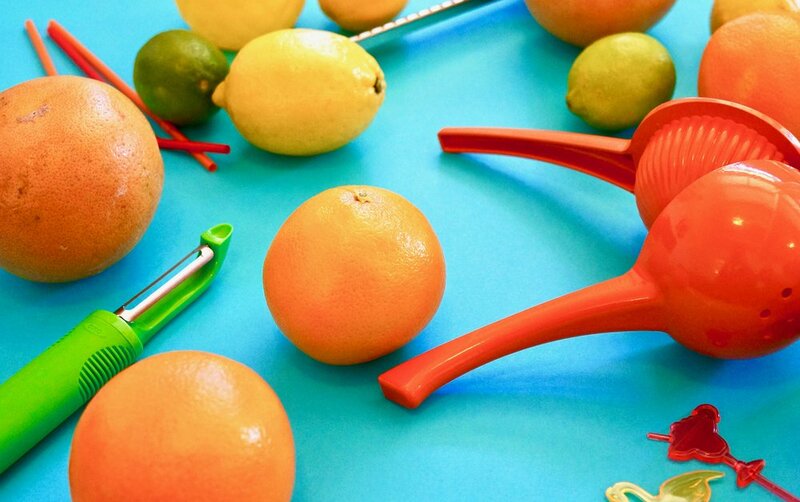 We're arming you with only the essentials so nothing you purchase will go to waste if you continue making drinks. If you're interested in saving some money, just know that making drinks at home is super affordable compared to heading to your local tiki bar every time you're in the mood for a tropical cocktail! What will I be able to do once I finish reading your ebook? How long is the ebook? 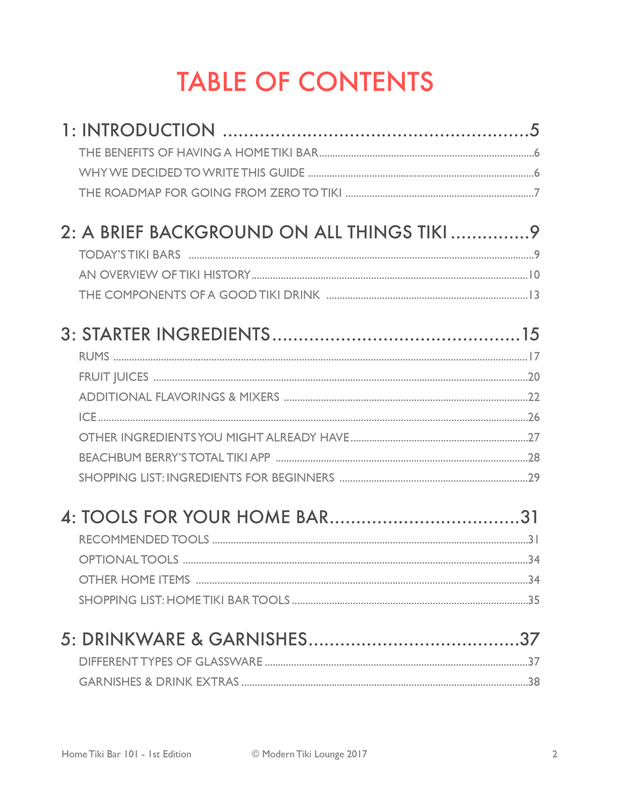 Home Tiki Bar 101 is a whopping 67-pages long. It's packed with all sorts of useful information! Sure! The Table of Contents is shown below. Click the pages to expand them to full size! What if I don't like Home Tiki Bar 101 after I purchase it? If you're not satisfied with your purchase, no problem. Just reach out to us within 30 days to let us know what we could have done better and we'll refund you the full amount. How do I get in touch with you if I have any questions? It's time to sip some tropical cocktails! Aloha! Kelsi and Greg here. We run the lifestyle blog, Modern Tiki Lounge, where we share our passions for tiki culture & mid-century modern design with our readers. While we've been exploring home mixology for a few years now, we certainly remember our bumpy start to building our own home tiki bar. We quickly got frustrated with just how many ingredients were required of each recipe and we were overwhelmed by the cost to get everything stocked to a good point. We had wished that there was a guide that would just tell us the essentials so that we would be well-equipped with most of the ingredients for most tiki drink recipes. That's why we decided to write Home Tiki Bar 101 for all of the beginners out there. We hope that it makes the process of getting started a bit easier and that it encourages our readers to fully embrace the exploration of all things tiki.